You are currently browsing the tag archive for the ‘art exhibition’ tag. 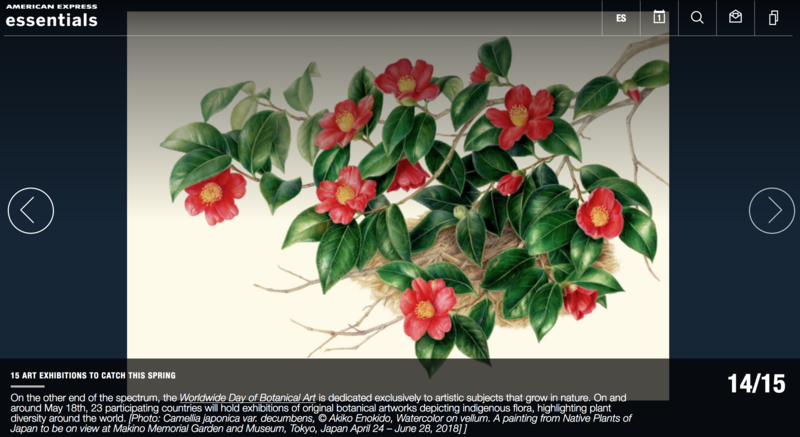 The American Society of Botanical Artists (ASBA) has announced the selected artists for Botanical Art Worldwide: America’s Flora, a groundbreaking collaboration between botanical artists, organizations, and institutions around the world. This worldwide exhibition and its events will call attention to the importance of conserving our planet’s botanical diversity. Each participating country will provide digital slide shows of up to forty works, to be compiled with all other countries’ images and shown at each venues during the run of each exhibition. Opening events, lectures, demonstrations, webinars, workshops and other events will be held (with some shared online), so visitors can learn more about contemporary botanical art and the earth’s floristic regions and botanical wealth. 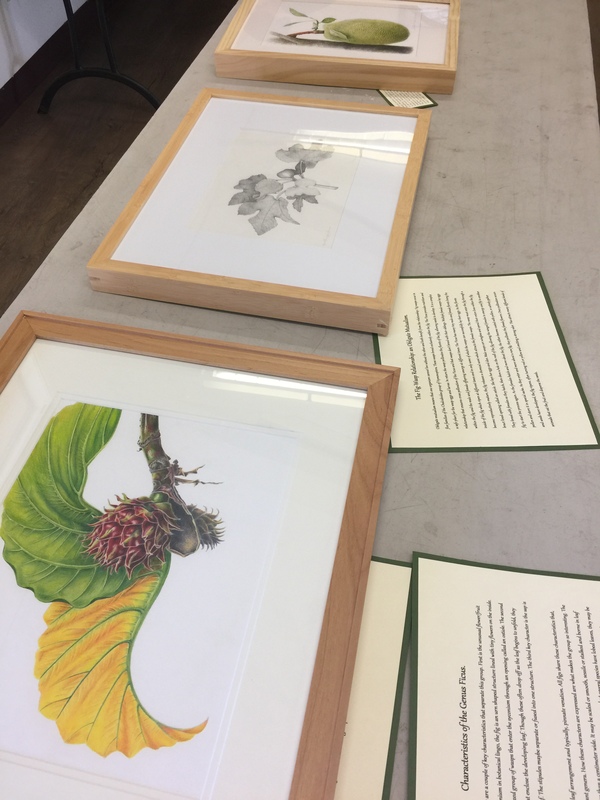 For the US exhibition, the jurors were: Susan T. Fisher, Botanical Artist and Educator; Patricia Jonas, Author and Editor; William McLaughlin, Plant Curator, US Botanic Garden; and, Susan Pell, Ph.D, Science and Public Programs Manager, US Botanic Garden. 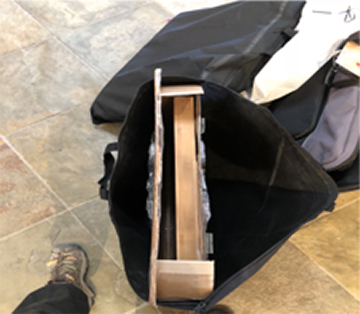 The jurors selected 46 artworks from more than 200 submissions, including artwork by BAGSC members Mitsuko Schultz, Gilly Shaeffer, and Deborah Shaw. A complete list of artists can be seen on the ASBA website. 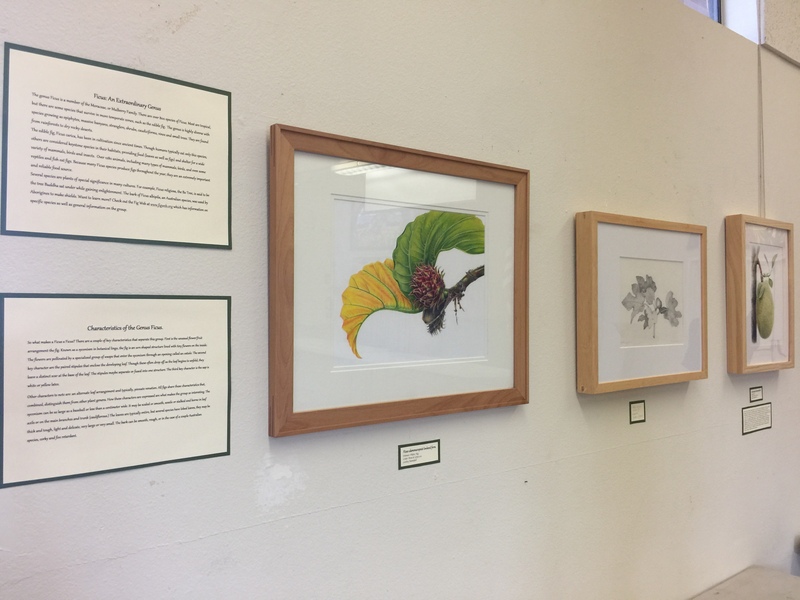 All artworks feature native plants of the US, and images will be available on the ASBA website once the exhibition opens. 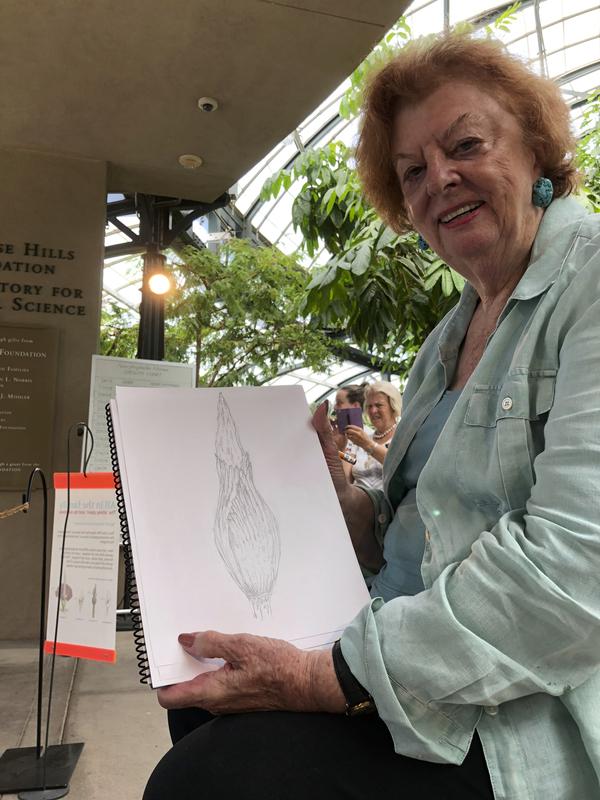 The ASBA, in collaboration with the United States Botanic Garden in Washington, D.C., will present the juried exhibition of plants from around the United States, staged in the U.S. Botanic Garden’s gallery space. 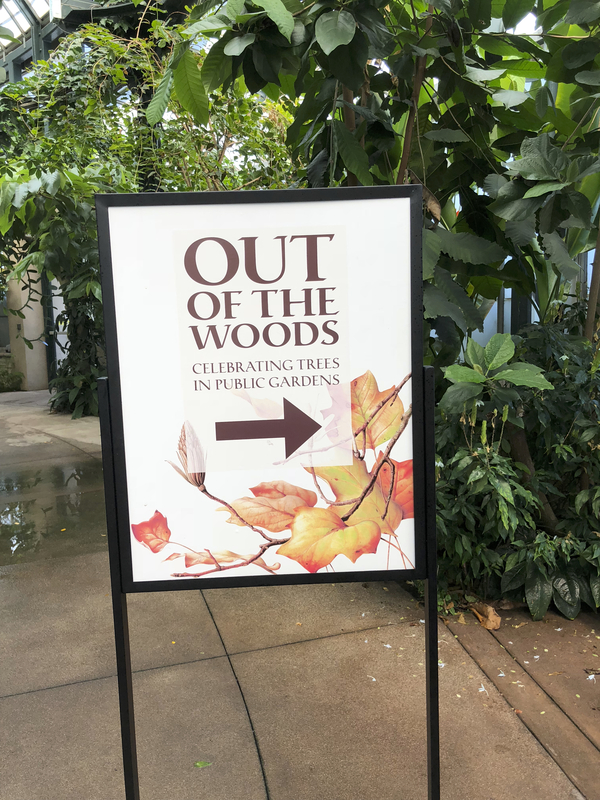 After remaining on view at the U.S. Botanic Garden through October 2018, the exhibition will then travel through the end of 2019. Similar exhibitions will be held in more than twenty other countries. A Worldwide Day of Botanical Art will be held on May 18, 2018, with events held for 24 hours, following the sun from venue to venue. Participating countries include: Australia, Bermuda, Brazil, Canada, China, Costa Rica, France, Germany, Indonesia, Ireland, Italy, Japan, Korea, Mexico, Netherlands, New Zealand, Russia, Scotland, South Africa, Thailand, the United Kingdom and the United States. Several other countries are in the planning stages and will be announced. Presenting a unified message about the ability to link people with plants through botanical art. Acknowledging and building upon the increasing connections between botanical artists worldwide. Increasing appreciation and understanding of the world’s plant diversity and its interconnectedness. 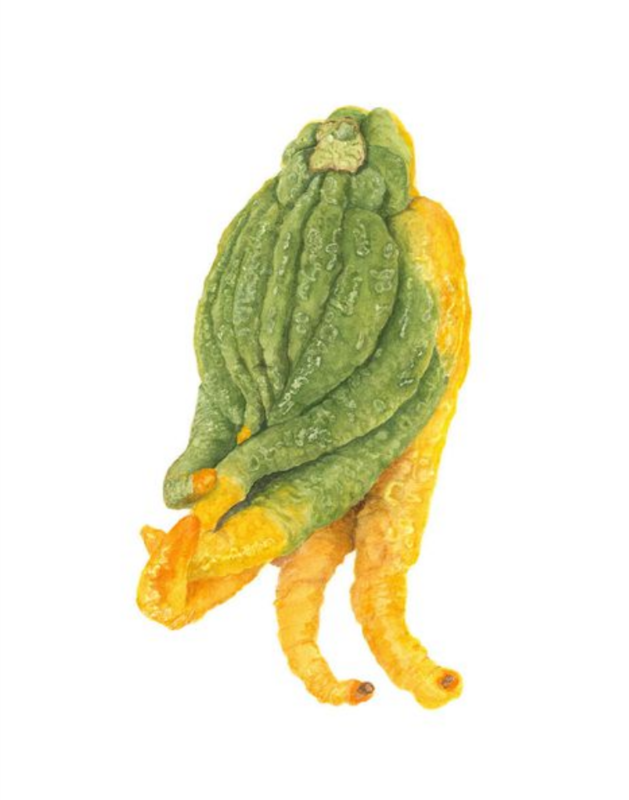 Raising awareness about the worldwide movement in botanical art. To engage in a project to document some of the wild plant species of the world. Click here for Botanical Art Worldwide Exhibition Info and Participating Countries Be sure to return to the ASBA website to see updates about the artists and the exhibitions. Congrats to all the participating artists, organizations, and institutions from around the world! Click any of the images below to see an enlarged image with artwork information. Platanus racemosa, California sycamore, © Mitsuko Schultz, 2017, watercolor on paper. Brodiaea filifolia S. Watson, Thread-leaved Brodiaea, Deborah B. Shaw, © 2012, watercolor on Kelmscott Vellum. Image protected by Digimarc. 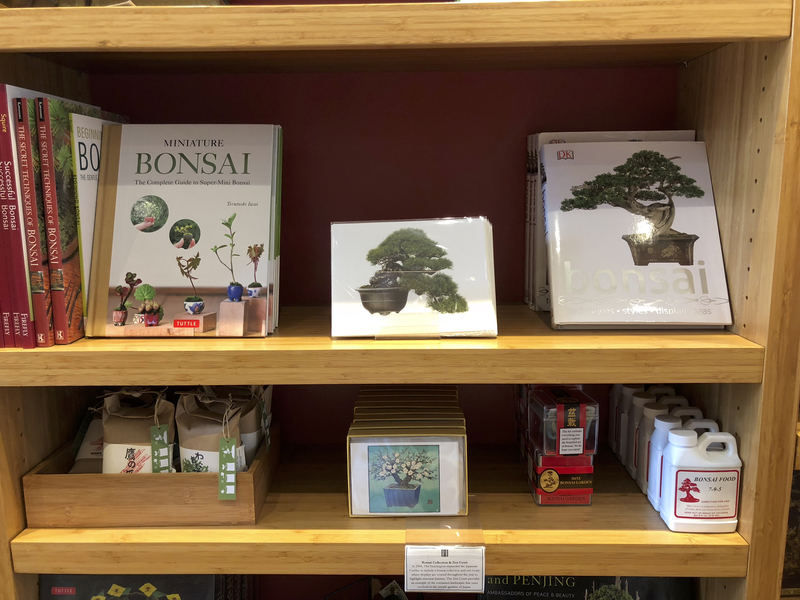 BAGSC’s Ficus Exhibition at The San Diego Botanic Garden’s Ecke Hall opened on Thursday, November 2, 2017. 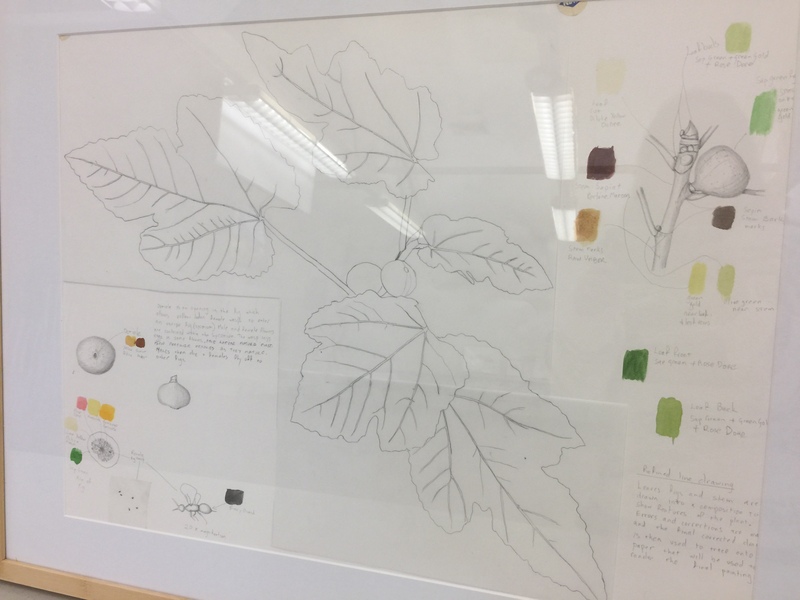 In addition to written posters describing the morphology of the Ficus species, leaf rubbings, ink prints, sketches and color studies complement the educational component of the exhibition. © 2017, Janice Sharp. Photo by Olga Ryabtsova, © 2017. Nineteen Ficus artworks, by 11 artists, are featured in the exhibition. A wonderful diversity of techniques have been used by the artists. In addition to the “traditional” watercolor, colored pencil and graphite there are leaf ink prints, graphite leaf rubbings, linoleum cut hand colored prints and tape-mounted fig wasps. Three written posters describing the Ficus species, their fertilization and biology provide an educational component to the exhibition. Thank you Cristina Baltayian, Cynthia Jackson, Susan Jackson, Arillyn Moran-Lawrence, Lesley Randall, Robyn Reilman, Olga Ryabtsova, Janice Sharp, Deborah Shaw, Beth Stone, and Anna Suprunenko for your participation and for making the show a success. © 2017, Janice Sharp. Photo by Olga Ryabtsova, © 2017. The show closes November 30 so make your plans to visit The San Diego Botanic Garden. The San Diego Botanic Garden is located at 230 Quail Gardens Drive, Encinitas, CA 92024. Janice Sharp placing labels throughout the exhibit. Photo by Olga Ryabtsova, © 2017. Photo by Olga Ryabtsova, © 2017. 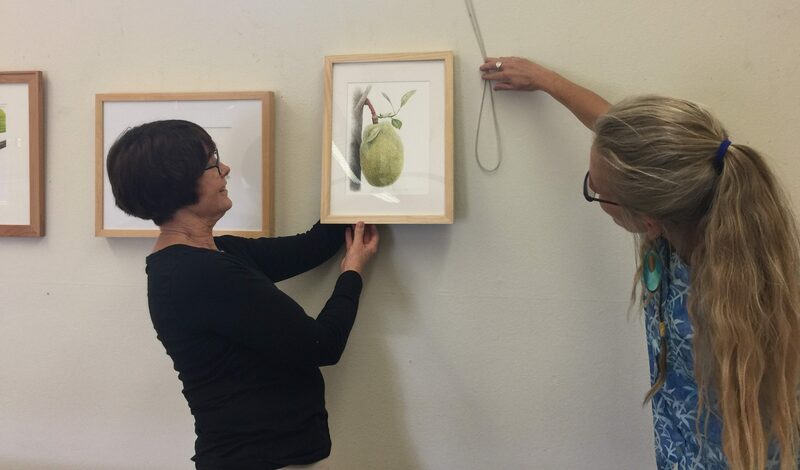 Janice Sharp (left) and Lesley Randall (right) hang Olga Ryabtsova’s painting of a Jackfruit. Photo by Olga Ryabtsova, © 2017. Artwork from the “Visual Voyages” exhibition at The Huntington Library, Art Collections and Botanical Gardens. José María Carbonell, Loranthus, Royal Botanical Expedition to the New Kingdom of Granada led by José Celestino Mutis (1783–1816), tempera on paper, approx. 21¼ × 15 in. Archivo del Real Jardín Botánico- CSIC (Madrid). Join BAGSC and The Huntington Library, Art Collections, and Botanical Gardens for an innovative seminar, held in conjunction with The Huntington’s exhibition “Visual Voyages,” part of the Getty’s Pacific Standard Time: LA/LA initiative. BAGSC and The Huntington are co-sponsoring this exciting weekend in November, and are experimenting with a new seminar format. Participants can register for one or more (or all) of the seminar components. BAGSC members have first options on spaces. Each of the seminar components are open to BAGSC Members, their guest(s), and the public. Individual prices are listed with each description; the price for the complete seminar package is listed below. See full details about the seminar on BAGSC’s website, along with information about how to register for some or all of the events described below. Join us for a private exhibition tour and discussion of “Visual Voyages” led by Lugene Bruno and Alice Tangerini: 5:00 pm – 7 pm. 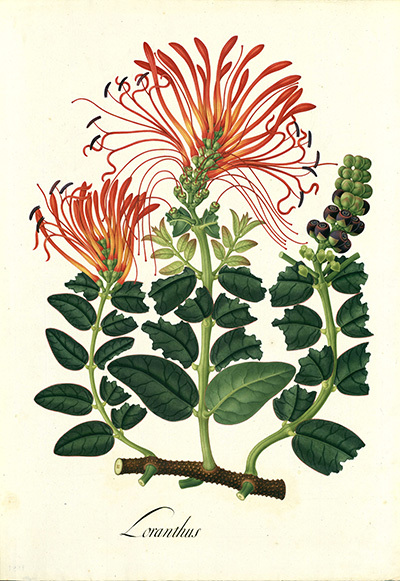 This seminar will be a discussion of the artwork of images of Latin American Nature in the exhibition and will compare and contrast the works to contemporary botanical art. Round Table Discussion and Tour of “In Pursuit of Flora: 18th-Century: Botanical Drawings from The Huntington’s Art Collections.” Go from Latin America in the Boone Gallery Friday evening to British artists in the Huntington Art Gallery — Works on Paper room. “In Pursuit of Flora” pulls work from The Huntington’s collection to reveal 18th-century European appreciation for the beauty of the natural world. 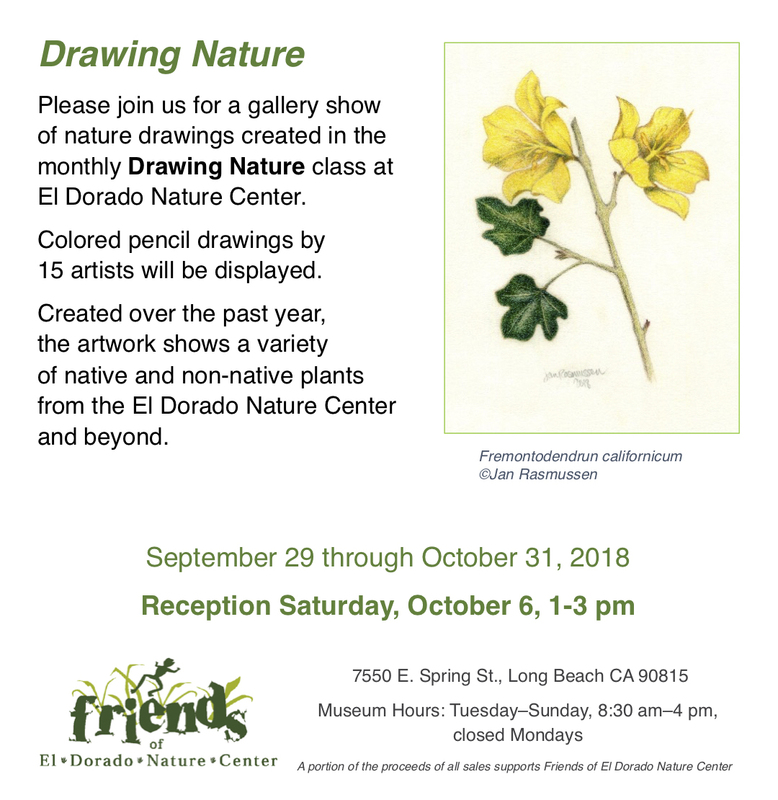 Lugene Bruno and Alice Tangerini will lead a tour of this exhibition and discussion of the artwork, as it compares to the “Visual Voyages” exhibition and contemporary botanical art. A practical (and fun!) demonstration of pressing and preserving plants for future drawing and painting, and secret recipes for “restoring” preserved samples to use for drawing and painting. 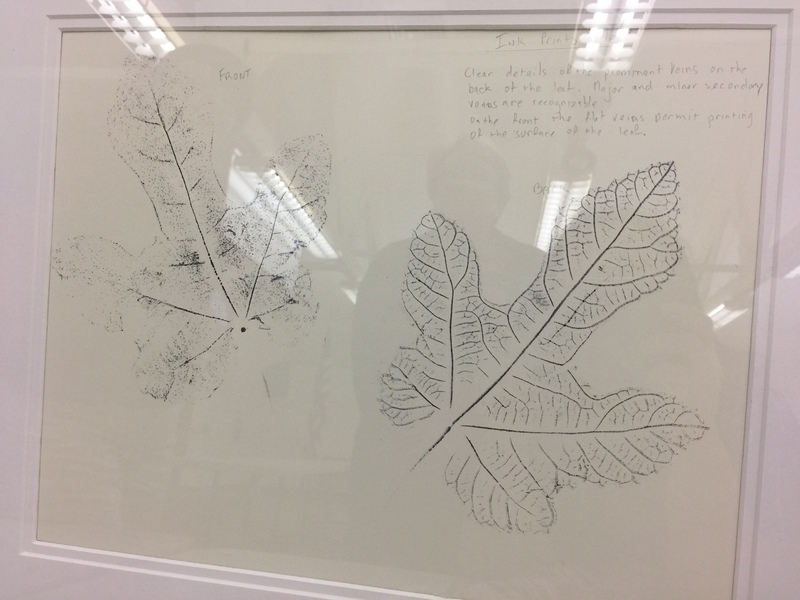 Learn how to press plants to preserve specimens for future drawing and painting, as well as how to “bring them back” to view for drawing and painting. Alice Tangerini: 1:00 pm – 4:00 pm. Individual Portfolio Reviews. Lugene Bruno will provide private portfolio critiques by appointment, one-half hour each: 1:00 pm – 4:00 pm. Reviews will be scheduled on a first-come, first-served basis for the best time possible for your schedule, and for Lugene’s. Gymnanthemum koekemoerae, © 2017 Alice Tangerini. 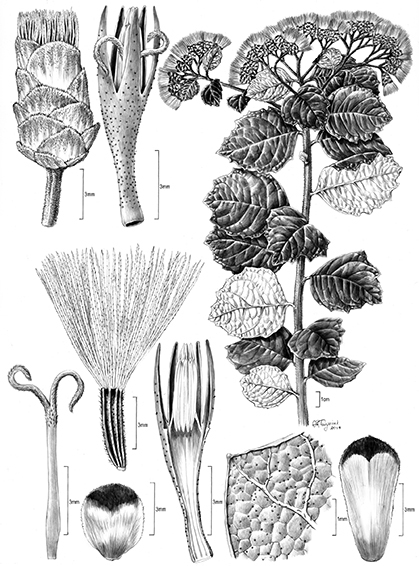 Botanical Scientific Illustration Workshop. Pencil and watercolor on film, Alice Tangerini: 10:00 am – 2:15 pm. A hands-on workshop using pressed, “revived” and live specimens. Workshop will break for lunch. Lunch will not be provided; please bring your own, or feel free to purchase lunch at one of The Huntington’s cafés. Please be advised that the cafés can be crowded on the weekends. Please note: the workshop costs above do not include materials. 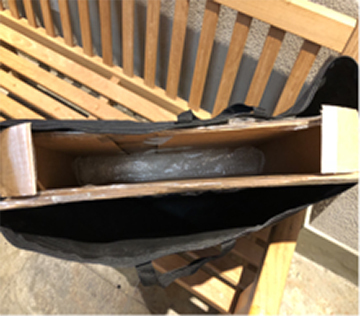 BAGSC will purchase some of the materials in bulk to save money for participants; we will post materials costs as soon as possible. Individual Portfolio Reviews. Lugene Bruno will provide private portfolio critiques by appointment, one-half hour each: 10:00 am – 2:00 pm. Reviews will be scheduled on a first-come, first-served basis for the best time possible for your schedule, and for Lugene’s. Please only request an appointment within the allotted time frame; we may not be able to accommodate other times due to other scheduled seminar activities. 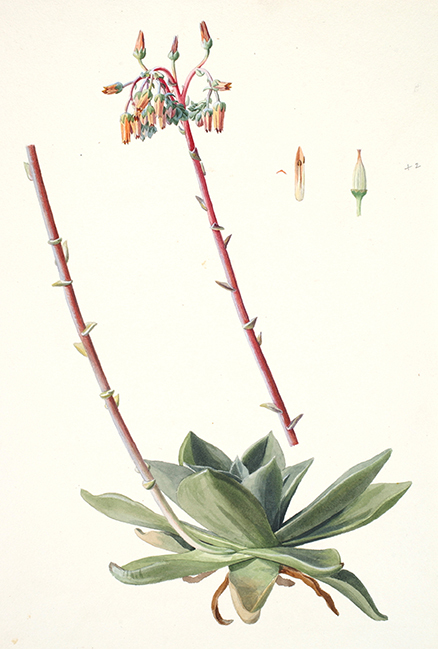 Dudleya rigida Rose, Crassulaceae, watercolor on paper by Frederick A. Walpole (1861–1904), 1897, 35.5 x 25.5 cm, on indefinite loan from the Smithsonian Institution, Hunt Institute for Botanical Documentation accession no. 4304. 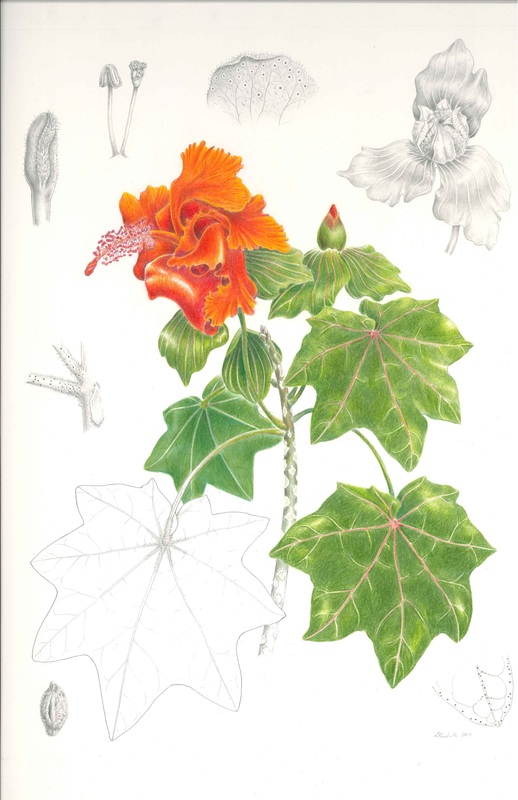 “Hidden Treasures: The rediscovery of art treasures in our collections” Public Lecture with Alice Tangerini, Smithsonian Institution and Lugene Bruno, Hunt Institute for Botanical Documentation, Carnegie Mellon: 3:00 pm – 4:00 pm in Rothenberg Hall. Lugene Bruno and Alice Tangerini will present an illustrated lecture on missing artworks that were rediscovered in and curated for their museum collections. These art pieces represent historical events and important discoveries or were created for publications in the realm of science and art. They may have been stored in places where their presence was not easily detected; sometimes amongst old boxes of artifacts, in the files of herbarium specimens or even catalogued as another kind of object. Artists such as Frederick Walpole (1861–1904), Paulus Roetter (1806–1894), Isaac Sprague (1811–1895) and Mary Emily Eaton (1873–1961) portrayed each plant subject with aesthetic beauty and scientific accuracy. Walpole divided his time between Washington D.C. for the USDA and field trips to the Northwest as far as Alaska, during which time he made field drawings, watercolors and exquisite ink drawings that resemble fine line engravings. His talent was extinguished at 43 when he died of typhoid while working in California. Isaac Sprague, a self-taught artist, and one-time assistant to John James Audubon, was one of the most prolific illustrators of the 19th century and, from his home in Massachusetts, he drew in pencil and ink illustrations for published descriptions of native floras and plants collected during exploring expeditions and railroad surveys by some of the most important botanists of the period. Paulus Roetter, an émigré from Germany went on to create some of the finest drawings of the cactus family while accompanying the botanist George Engelmann on one of the government boundary surveys in the Southwest from 1853–1854. Engelmann named the cactus Cereus roetteri in honor of this artist’s skill. Mary Emily Eaton contributed drawings and watercolors for a four-volume opus, Britton’s The Cactaceae (1919–1923), while working as a scientific illustrator for the New York Botanical Garden. She lost her job during the depression and returned to England where she exhibited her work over the years. Each artwork has a storied past, and the history and the images of the artist’s field studies and finished drawings and paintings that were rediscovered in the collections will be featured in this presentation. By curating, cataloging and imaging these art works the Smithsonian Institution and the Hunt Institute preserve for the future a part of American history. Questions? Contact the BAGSC Education Chair. Lugene Bruno, Curator of Art & Senior Research Scholar at the Hunt Institute for Botanical Documentation, Carnegie Mellon University, Pittsburgh, PA.
Lugene Bruno, Curator of Art & Senior Research Scholar at the Hunt Institute for Botanical Documentation, Carnegie Mellon University, Pittsburgh, PA. Since 1996, Lugene Bruno has held a position at the Hunt Institute for Botanical Documentation where she has immersed herself in the collection. She is responsible for all activities of the Art Department, including the curation of the art collection and twice-yearly exhibitions in the Institute’s gallery (most notably the triennial International Exhibition of Botanical Art & Illustration). She designs the exhibitions and companion catalogues; provides talks and tours related to collection items on site and at botanical conferences; responds to research requests; and makes available for study selections of the art collection to visiting scholars, students and artists. She is an honorary member of several botanical art and florilegia societies in the United States and abroad. Bruno is also a practicing artist working with the concepts of gestural abstraction and employing the mediums of photography and graphite drawing. Alice Tangerini, Staff Illustrator and Curator of the Botanical Art Collection at the National Museum of Natural History, Smithsonian Institution in Washington, DC. 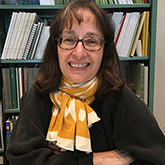 Alice Tangerini, Staff Illustrator and Curator of the Botanical Art Collection at the National Museum of Natural History, Smithsonian Institution in Washington, DC. 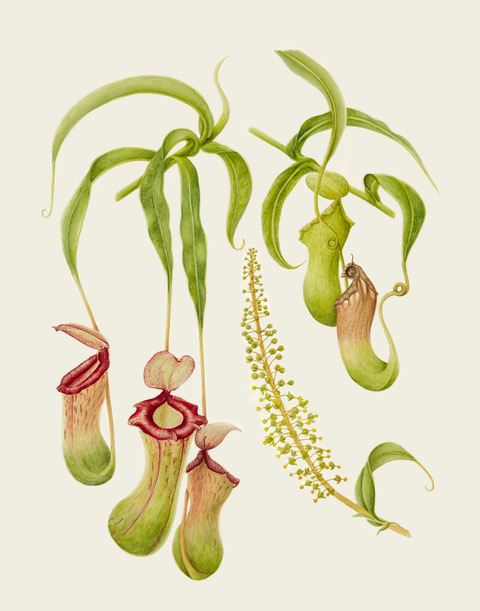 As a Staff Illustrator for the Botany Department at the National Museum of Natural History, Smithsonian Institution, Alice Tangerini has been specializing in drawing plants in pen and ink and graphite since 1972 and now her illustration media includes digital color.She has illustrated at least 1000 species of plants appearing in scientific periodicals, floras, and botanical and nature books. 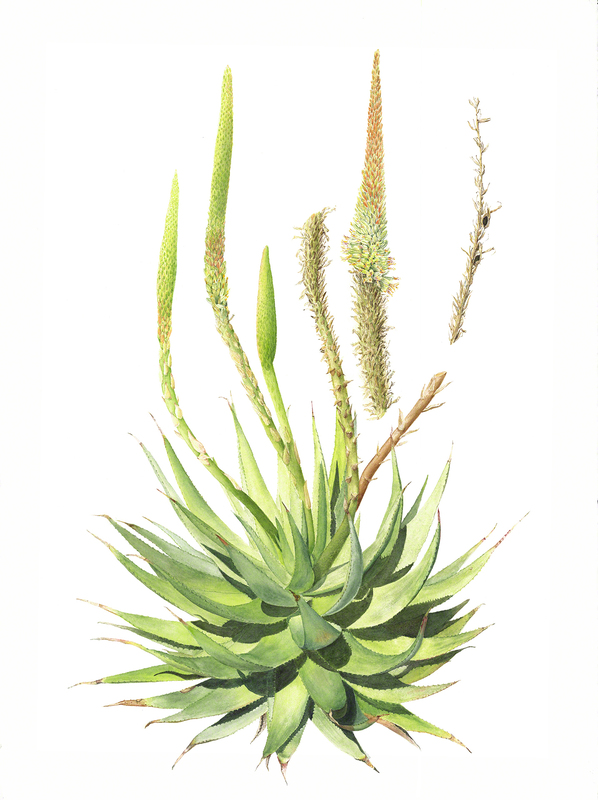 Most of her subjects are based on the Department’s extensive collection of over 4 million herbarium specimens.Alice also teaches classes in illustration techniques, presents lectures on botanical illustration and juries shows in botanical gardens and in academic institutions.She has exhibited her botanical artwork in numerous shows connected with the botanical and scientific illustration societies of which she is also a member. 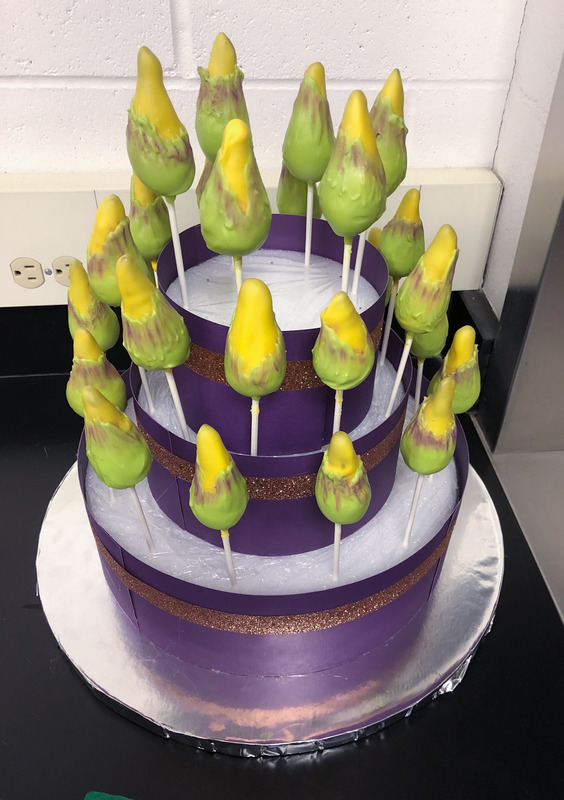 Her responsibilities in the department also include managing and curating an extensive collection of botanical illustrations, both historical and contemporary, which are available for viewing on the Department of Botany website. 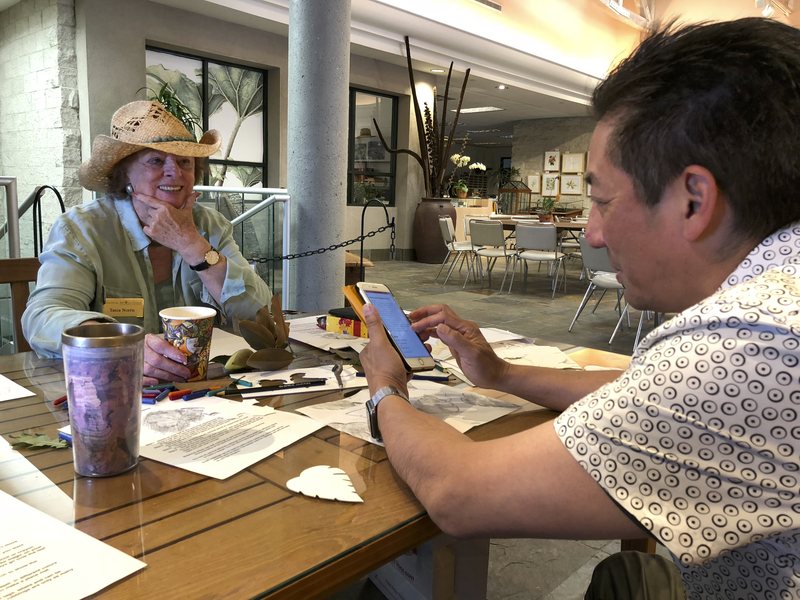 Matt Ritter talking with Diane Nelson Daly about her watercolor of Bauhinia x blakeana, Hong Kong Orchid Tree. 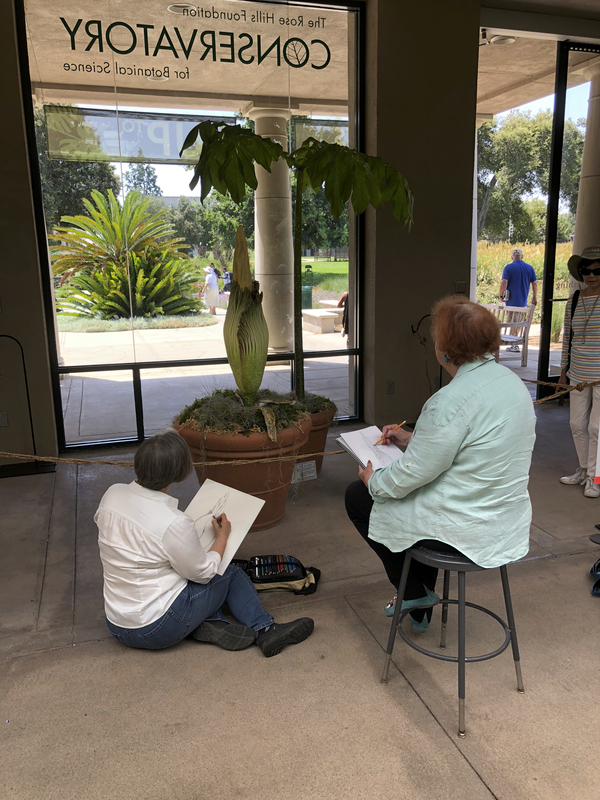 The Botanical Artists Guild of Southern California (BAGSC) celebrated its 20th Anniversary on August 26, 2017 with a three-event program held at the Los Angeles County Arboretum and Botanic Garden. 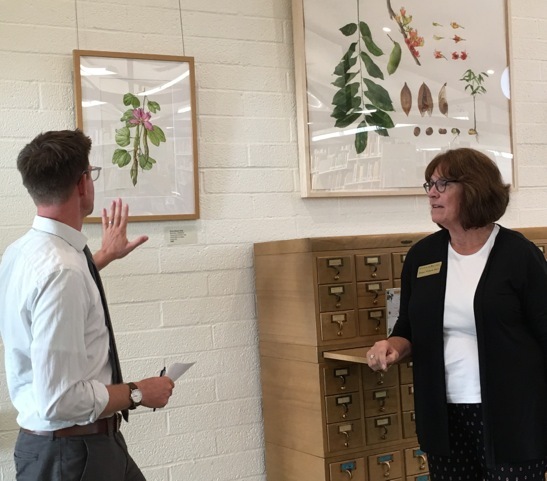 The late afternoon program started in the Arboretum Library with a tour of our current exhibition, Illustrating the Urban Forest: 20 Years of Botanical Art. Following a welcome from LA Arboretum Librarian Susan Eubank and BAGSC President Janice Sharp, our guest speaker, Matt Ritter, led the exhibit tour and called on several BAGSC artists to join him in discussing their paintings. 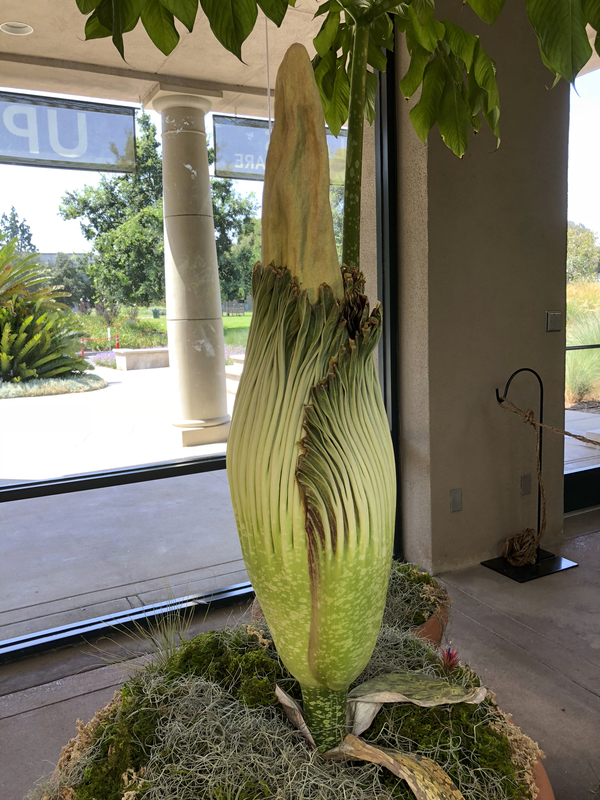 From the exhibition, BAGSC members and guests went to Ayres Hall at the Arboretum for Matt’s keynote presentation on the trees of Southern California. We were grateful to have Matt, a botanist, tree expert and very engaging speaker, share his knowledge of trees and take us on a tour of the urban forest. 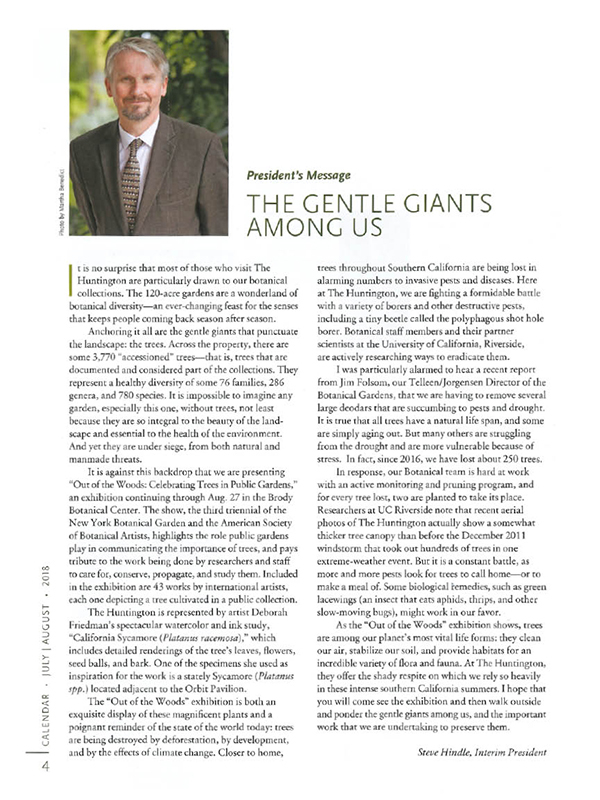 His presentation shed light on many issues that affect trees in our Southern California environment, as well as focusing on those that do well in our climate, neighborhoods, streets and parks. 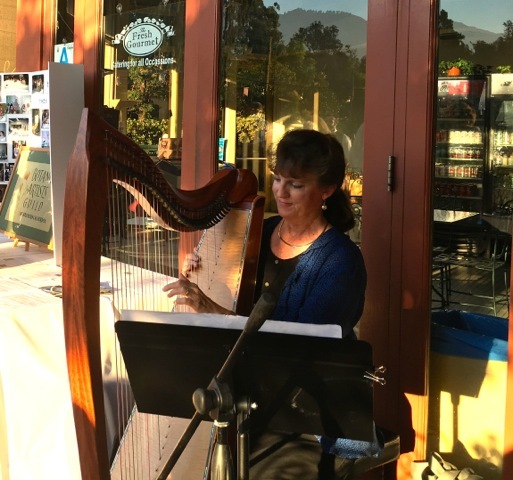 BAGSC member Terri Munroe played beautiful harp music to accompany our dinner on the Peacock Café patio. After Matt’s presentation, BAGSC members and guests meandered over to the Peacock Café patio. 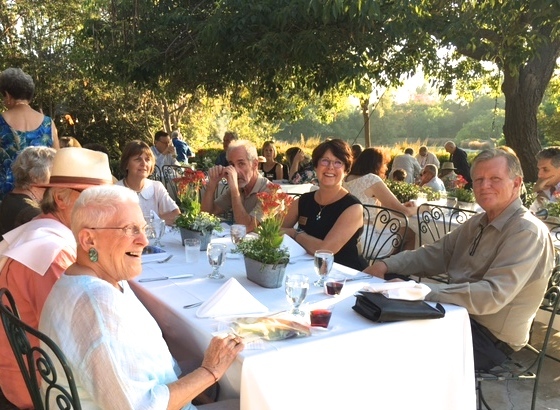 As members and guests arrived on the patio, we were welcomed by heavenly harp music by BAGSC member, Terri Munroe, and a magnificent view of the setting sun casting a golden light over our dinner celebration. Members and guests checked out a table display of our 20-year history in photographs, past BAGSC newsletters and other memorabilia from group events. Before beginning a delicious dinner, we heard a few words from a letter sent by Olga Eysymontt about the beginnings of our group, and listened to fun reminiscences of early times in BAGSC by Leslie Walker (a former BAGSC president). Janice Sharp (current BAGSC president) spoke about what the group is doing now and our plans for the future, including exhibitions, workshops and collaborations with various public gardens in Southern California. An elegant and delicious dinner on the patio of the Peacock Café. Later during the dinner program, I had the pleasure of expressing the group’s deepest appreciation on behalf of BAGSC members to three members who have made outstanding contributions to our group over the years. The first person to be mentioned was Tania Marien. She was responsible for starting our BAGSC newsletter, and was editor for a number of years. 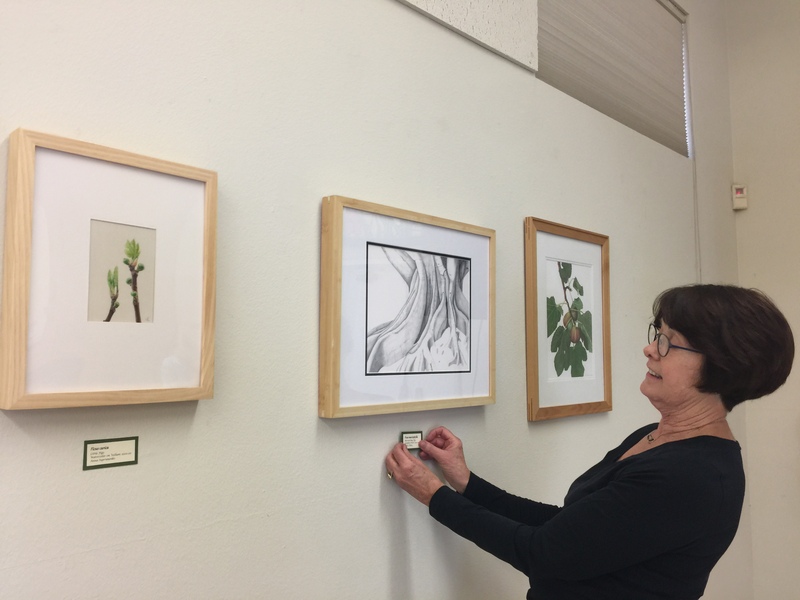 Her selfless spirit and dedication to botanical art found further expression when she became one of the main organizers for the American Society of Botanical Artists (ASBA) 2008 Annual Conference which was held at The Huntington Library, Art Collections and Botanical Gardens in San Marino, California. In 2015, Tania played a major role again as a key organizer of the ASBA “Weird, Wild & Wonderful” Symposium which also was held at The Huntington. 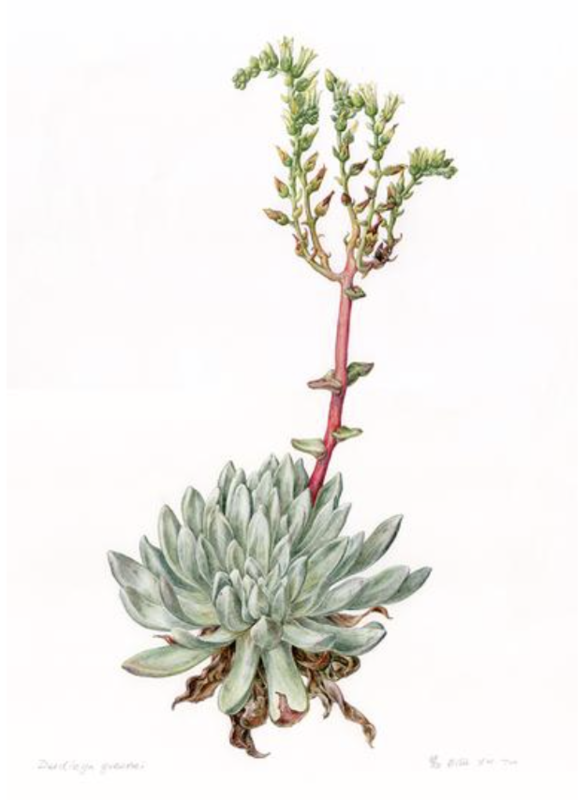 Her tireless efforts have increased awareness about plants and botanical art in Southern California and around the world. 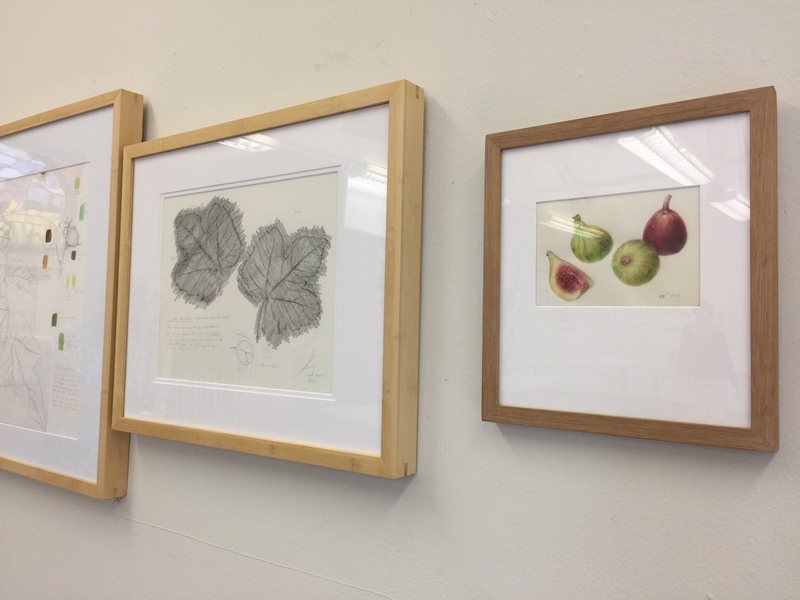 We are also grateful for the contributions made by Deborah Shaw to furthering people’s awareness of botanical art and the role of our BAGSC organization. Deb has been instrumental in helping our group become acquainted with current digital technologies. Some of her accomplishments include creating the BAGSC Blog and the beautiful BAGSC website. She has been an extraordinary force in keeping our membership well informed about BAGSC events and ASBA events. She was also a key organizer of the ASBA Annual Conference of 2008 and the ASBA “Weird, Wild & Wonderful” Symposium of 2015. It is hard to imagine how Deb manages to keep our group well informed while also creating paintings that draw great admiration. And last but not least, our Tania Norris deserves a big thank you for outstanding contributions she has made to BAGSC and botanical art. Tania helped to get the “ball rolling” which led to the 2008 ASBA Annual Conference being held at the The Huntington. She helped in many ways to make the first ASBA Conference held in LA a big success. Tania was also a key organizer for the 2015 ASBA “Weird, Wild & Wonderful” Symposium held at The Huntington. 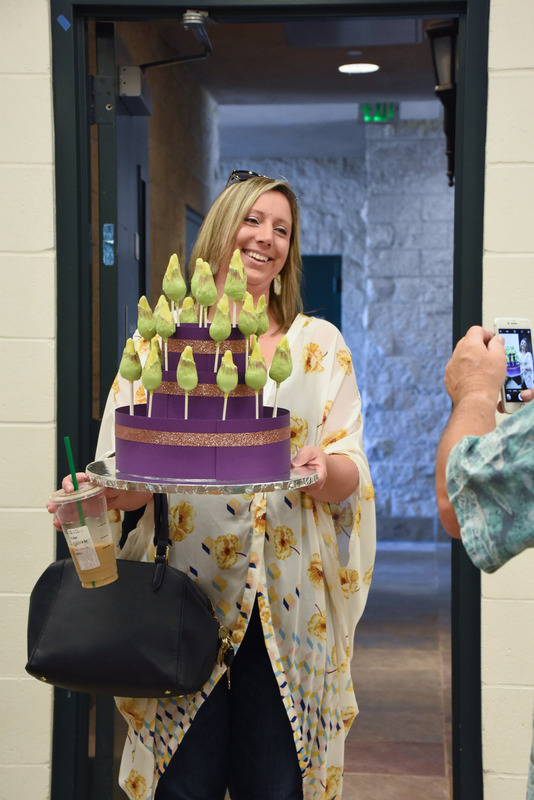 Her selfless efforts have helped to lay the foundation for a special collaboration between BAGSC and The Huntington Brody Botanical Center. 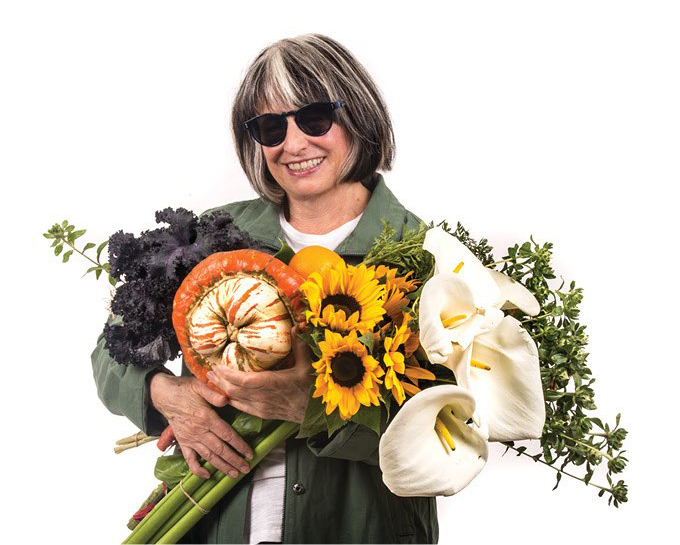 Her love for botanical art and her generous support have helped in establishing Los Angeles as a great place for this art form to thrive. A big and heartfelt thank you to the many others who also have contributed to BAGSC and botanical art over the last 20 years. The truth is, we could not have reached this 20-year milestone without everyone’s contributions and support, too numerous to name. 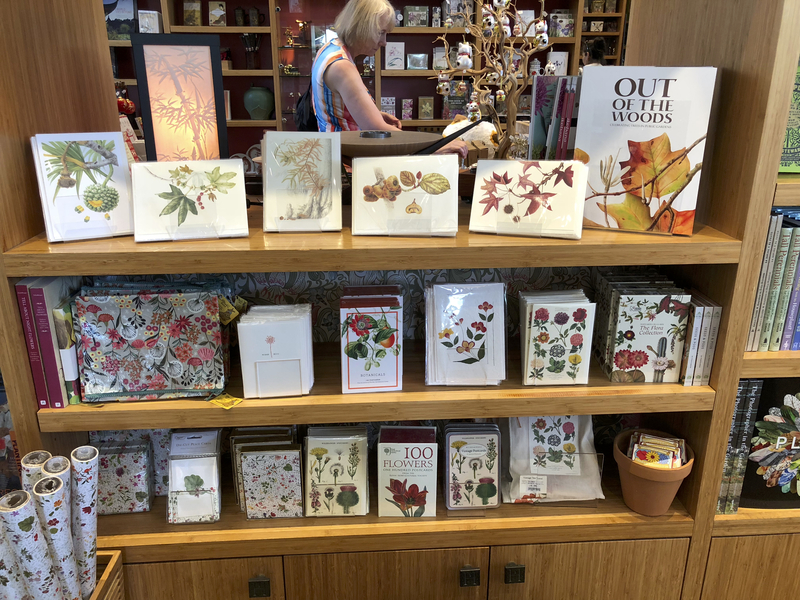 We could not have had this lovely event without the help of BAGSC member, Jan Clouse and her husband, Charles, who designed the printed post cards and invitations for this 20th celebration. Additional thanks go to Cristina Baltayian for designing and creating the floral centerpieces for the tables. Thank you to Terri Munroe, for volunteering to play music for the dinner, which added a special magic to our evening. 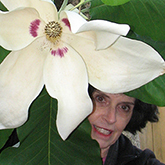 And, of course, a heartfelt thank you to Susan Eubank and the LA Arboretum—one of our first botanical homes and an avid supporter of BAGSC, plants, and botanical art. Most importantly, thank you to all our dedicated members and supporters for all you have done during this 20-year period to make us the strong and vibrant group we are today. We gratefully look forward to the next 20 years. P.S. from BAGSC members: A big thank you to Gilly Shaeffer, who served as BAGSC President for many years, and volunteered to chair our 20th Anniversary Celebration committee. BAGSC Members and their guests gathered in the Arboretum Library for the artists’ walk-through, led by Matt Ritter. BAGSC Members and their guests gathered in the Arboretum Library for the artists’ walk-through, led by Matt Ritter. (L to R): Tania Marien, Tania Norris, and Leslie Walker. Janice Sharp introduces Matt Ritter. Listening to Matt Ritter’s introduction to the artists’ walk-through. Matt Ritter introduces the exhibition and himself. 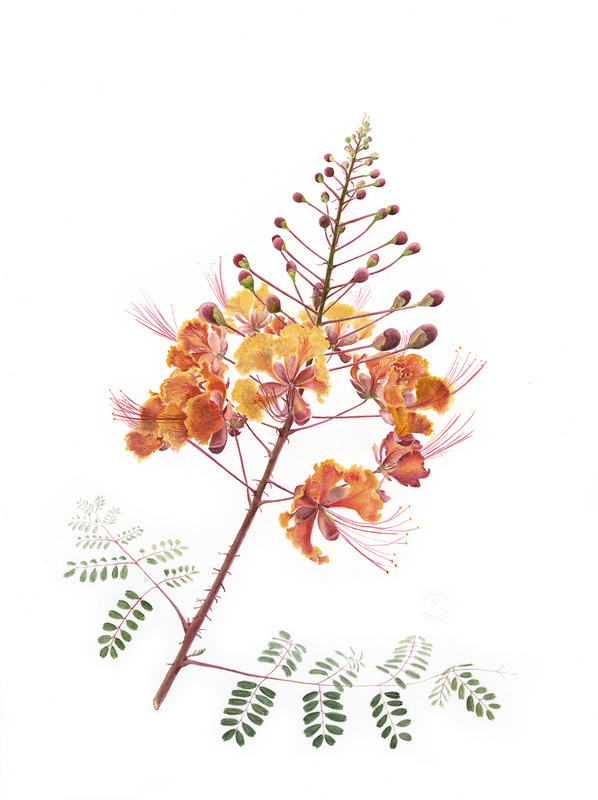 Deborah Shaw discusses her Castanospermum australe, watercolor on paper. Matt Ritter and Cynthia Jackson discussing her watercolor on paper of Brachychiton rupestris, Queensland Bottle Tree. 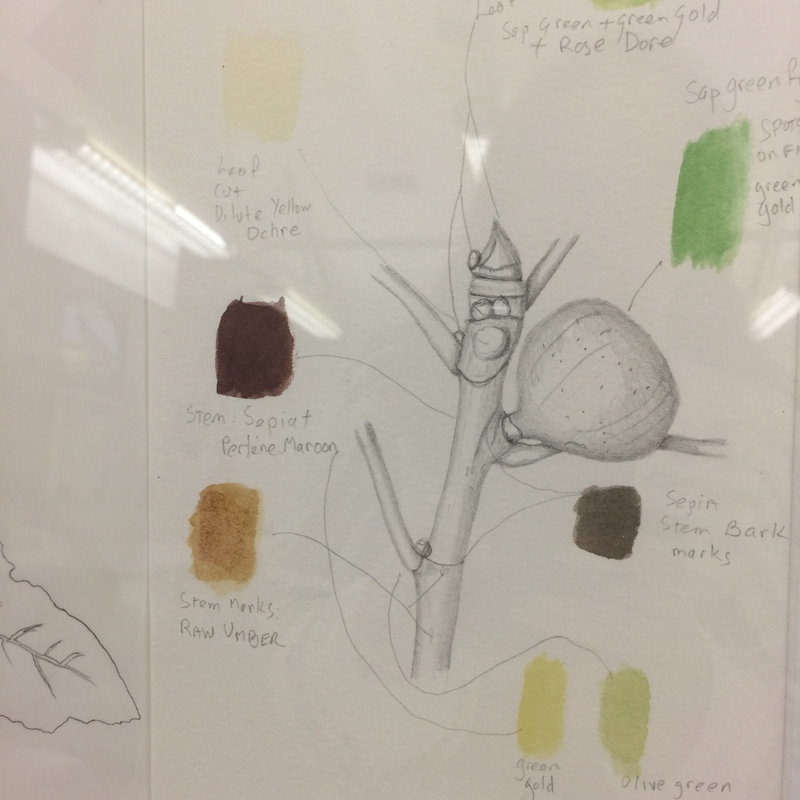 Matt Ritter and Susan Jackson discuss Susan’s Platanus racemosa, California sycamore, and the annual raking of Sycamore leaves, watercolor on paper. Matt Ritter discussing Janice Sharp’s Eucalyptus racemosa, Scribbly Gum, and why the scribbles disappear when the tree is grown away from Australia, watercolor/gouache on paper. Kate Gaman looks over BAGSC’s 20-year history. Tania Marien looks at the BAGSC history display. Elegant and delicious dinner and drinks on the patio of the Peacock Café as the sun sets.